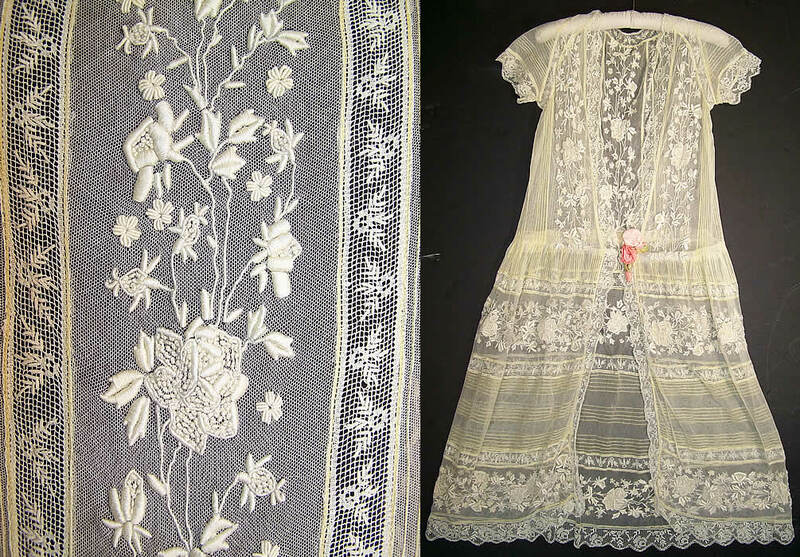 This exquisite vintage cream embroidered net lace, silk rosette, drop waist dress coat dates from the 1920s. It is made of a sheer off white, yellowish cream cream color net, with pleating, raised padded satin stitch embroidered flowers, French knot details and crochet filet lace net floral leaf pattern design trim inserts and edging. 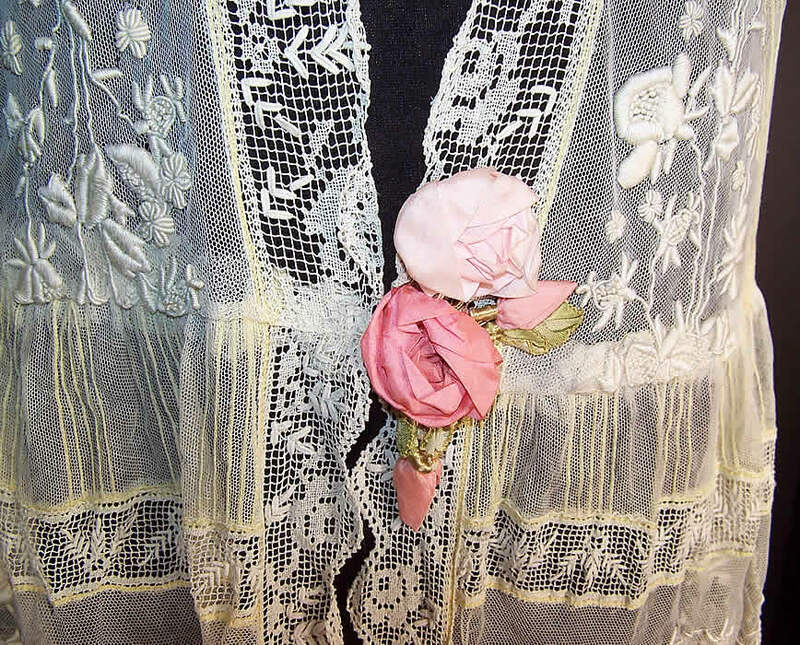 There is a pink pastel silk ribbon work rosette rosebud flower trim sewn onto the front opening at the drop waist. 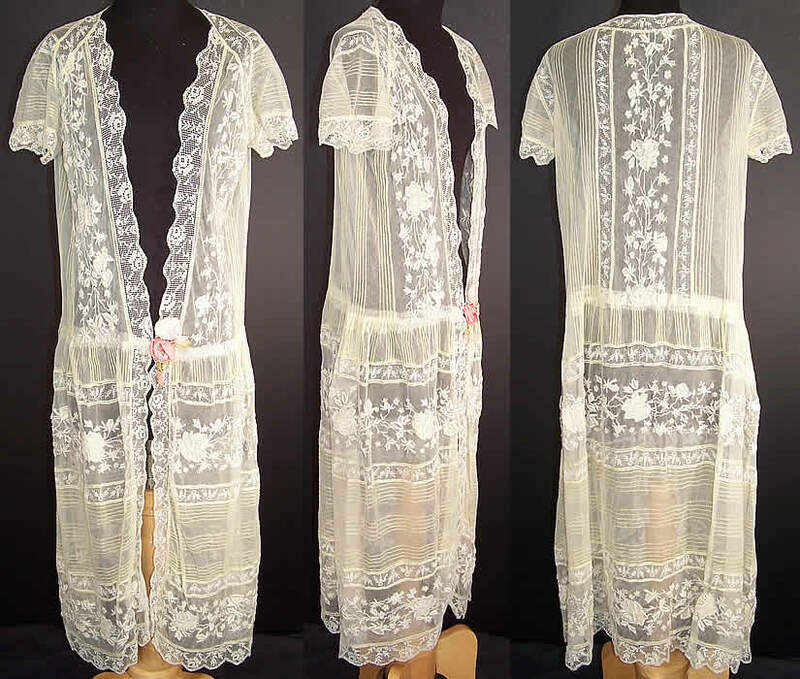 This lovely lace robe style dress coat has a loose fitting drop waist open front style, with a hook & eye closure at the waist and short sleeves. It is sheer and unlined. The dress measures 44 inches long, with a 38 inch waist and bust. It is in good wearable condition, with only a small mended repair on the bottom hemline and a few tiny pin holes in the net. This is truly an extraordinary piece of wearable lace art! If Edith isn't wearing something like this with the matching straw hat to go with it in season 3 of Downton Abbey, there is something wrong. Honestly, this would be a "casual Friday" for Edith, ever bejeweled!